Glaucoma is the second most common cause of blindness. In india there are 12 milion affected people with glaucoma. Glaucoma is a disease that damages the optic nerve by raising the pressure in our eyes which can lead to gradual or sudden loss of vision. Glaucoma damages the optic nerves causing blind spots to develop in areas of vision. 90% of the people of glaucoma are unaware of their glaucomatous disease when first diagnosed. Glaucoma can only be controlled not cured. Vision once lost is not recovered. Early detection is the key to preserve sight. Persons above 40 years should undergo periodical eye examination for early detection of glaucoma. Laser Trabelculoplasty uses a very focused beam of light to treat the drainage angle of the eye. This surgery makes it easier for fluid to flow out of the front part of the eye, decreasing pressure in the eye. Most cases of glaucoma can be controlled with one or more drugs. But some people may require surgery to reduce their IOP further to a safe level. All glaucoma surgery procedures (whether laser or non-laser) are designed to accomplish one of two basic results: decrease the production of intraocular fluid (aqueous humor) or increase the outflow (drainage) of this same fluid. Trabeculectomy is a standard surgery for lowering pressure inside the eye when medical treatments or laser surgery have failed to bring the eye pressure low enough. In this operation, a small hole is made in the wall of the eye, and a “trapdoor” is created over this hole to allow fluid to escape the eye. 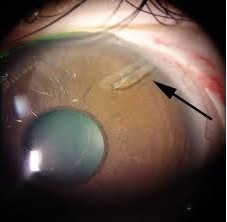 The fluid is shunted from inside the eye, past the obstructed trabecular meshwork, through the small hole and “trapdoor,” while remaining underneath the outer clear membrane of the eye (conjunctiva). This forms a small blister or “bleb” underneath the upper eyelid. In advance stages impending perforation, bandage contact lens & cynoacrylate glue therapy are done. 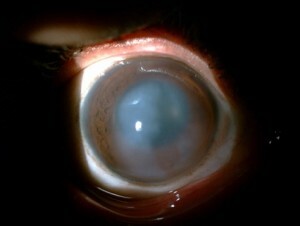 Therapeutic Corneal transplantation is done in perforated ulcer. Thinning and gradual bulging outward of the central cornea is known as Keratoconus. It affects one in every 2000 Indians. More prevalent in 2nd & 3rd decade of life. There is change in refractive status of the eye leading to distorted & blurred vision. 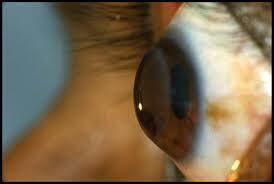 Keratoconus may lead to acute hydrops causing sudden vision loss. Corneal transplantation, also known as corneal grafting, is a surgical procedure where a damaged or diseased cornea is replaced by donated corneal tissue (the graft). 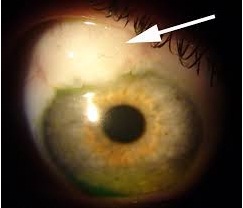 When the entire cornea is replaced it is known as Penetrating Keratoplasty and when only part of the cornea is replaced it is known as Lamellar Keratoplasty. Optical: To improve visual acuity by replacing the opaque or distorted host tissue by clear healthy donor tissue. Therapeutic : To remove inflamed corneal tissue unresponsive to treatment by antibiotics or anti-virals. 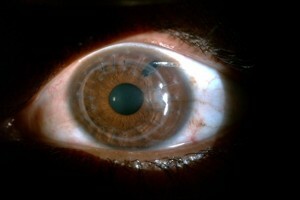 Cosmetic: To improve the appearance of patients with corneal scars that has given a whitish or opaque hue to the cornea.